To provide a place for parents and family members to meet and share experience, strength, give hope and awareness, to other families who have similar experiences raising children with ADD/ADHD, SPD, Anxiety, ASD, mental health diagnosis, developmental and behavioral challenges. Through sharing in this experience of raising these hard to raise kids, we grow stronger and more resilient. Holidays, changes and time off! Tomorrow we will celebrate the holiday season at our annual Christmas party and are so excited to see everyone attending! We filled EVERY SPOT! Wowza! It's going to be awesome. After tomorrow Utah Easy to Love will be taking the remainder of December off to spend time with our families through the Holidays. We will make an effort to answer pressing questions or concerns, but may be slow in our response. Our art program with UMOCA was amazing! We will be meeting with Jared and their educational director to work out a schedule for 2015! Stay tuned. We had an AMAZING turn out for our special needs Easter Scavenger hunt, and even better feedback. We cannot wait to do this again for our awesome families! E2L held our 3rd Annual parent retreat in Kaysville, this will continue being an annual event but we will be making changes to the format. It will be better than ever! We held our biggest fundraiser to date! Our first annual charity glow ball golf tournament at Swan Lakes golf course was a HUGE success! Held an awesome clothing drive for families raising children with special needs, everyone was so awesome in helping us spread the word and get donations together. We were able to help a lot of families get ready for the winter season! Big thanks to KONA karate for their sponsorship and help pulling this together. We lost one and gained one. Co-Founder and President Jennifer Levy moved to California the beginning of December. She will continue on the board and be involved from a far - but we will miss her. We also added Angela to the board as well as the position of volunteer coordinator/ community liaison, she has been an amazing addition to the group and has stepped up and in to her role with Utah Easy to Love - gun blazing! Angela put together Easy to Love's first Sub 4 Santa program this holiday season. We were able to help two families and are finishing up this week! We are so grateful to those who have pitched in for these families and cannot wait to make this a yearly program. So there you have it! It's been a busy and awesome year and 2015 is going to be even better. Watch for additional board members, a new website, awesome groups and activities and more!! We hope you all have a warm and happy holiday season. 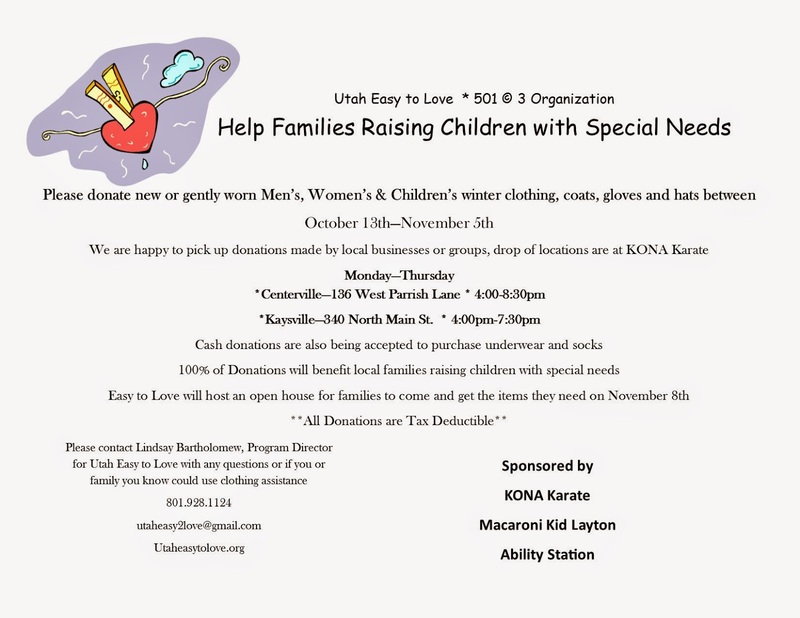 Utah Easy to Love is hosting a clothing drive October 13 - November 5. We are collecting new and gently used men's, women's and children's winter clothing, coats hats and gloves. We are also accepting cash donations to purchase things like socks and underwear. As special needs families we spend thousands of dollars of therapies, medical bills, special needs tools etc. and for many of us there is just not much left over for other basic needs like clothing. 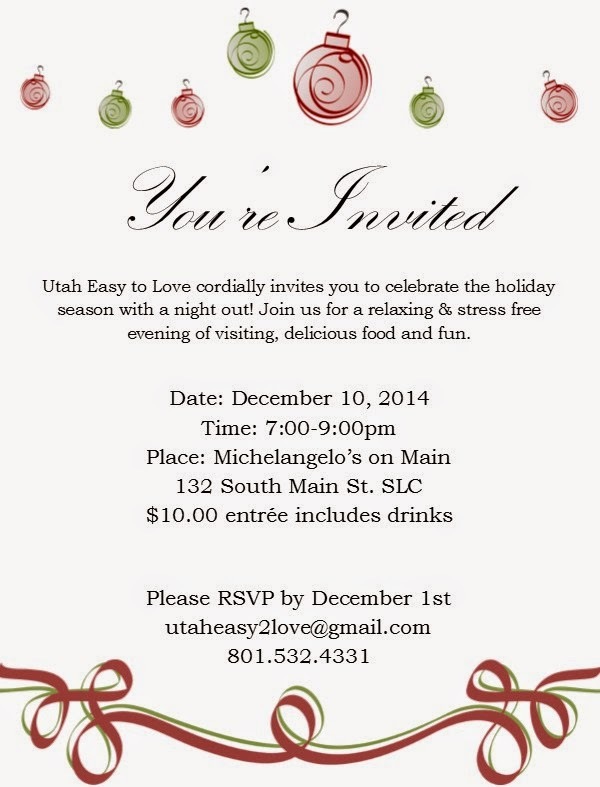 Utah Easy to Love wants to help families who are tight to have one less thing to worry about this holiday season. We will be hosting an open house November 8th for families to come and get the items they need. If you or a family you know (they must be special needs) need a little extra help please contact us for more specific information. Please contact Lindsay Bartholomew, E2L Program Director with any questions. We are happy to pick up donations outside the Davis County area, or donations made by local groups or businesses. Cash donations can be mailed to Utah easy to Love or done on our website under the 'Donate' button, please specify 'clothing drive' in the notes/comments box. All donations are tax deductible and 100% of donations will benefit local special needs families. ***IT person to help with new site/emails etc. We were given permission (along with a blessing!) by the authors of Easy to Love but Hard to Raise. The book is AMAZING, full of wonderful stories and expert advice. See the book review here on this blog! Find them on Facebook @ Easy to Love, Hard to Raise and link into their website listed in 'Some of our favorites'. Thank you Kay & Adrienne for your support!